Bring the whole family and enjoy this spacious home & outdoor paradise located in Isla Del Sol! 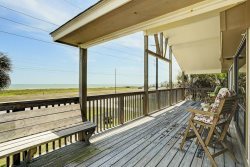 This exceptional canal front home is located on a cul-de-sac in Isla Del Sol on Galveston's West End. There are four bedrooms, three bathrooms and an abundance of outdoor entertaining space with pleanty of seating for all of your guests. Don't forget to bring your fishing poles! You can fish right off the dock, equipped with both underwater and overhead fishing lights, perfect for night fishing! Additional features include a boat dock, outdoor shower, fish cleaning table, propane grill, full size washer and dryer, and two refrigerators.